SNW Forum • View topic - It's Rosie! I don't know where to start. There's a lot I think you should know about me if you want to know some stuff about me. So I will try to tell a bit about myself and also about the website. I'll keep it short. Well I'll try. My posts are usually pretty extended. Grab a cup of coffee and take a seat! I'm the founder and webmiss of SporeNetwork (and SporeNetwerk, which is basically a Dutch copy of this site. Do not underestimate the "copy" part here. Translating takes a lot of time!). I am also the founder and webmiss of SimsNetwork and SimsNetwerk. I took over Simsplace from another Sims webmaster. So basically I have three Sims sites. As if that wasn't enough, I also decided to add Sporepedia (.co.uk, .nl and .be) to the list. I will offer creatures and downloads in the near future to our Sporepedia, as will some of our other team members. So far I've told you about what I am, not who I am. So I'll get to that now. My real name is Rosana Kooymans. If you see that name on any website, it probably means I've made the website, and in many cases own and maintain the particular website. 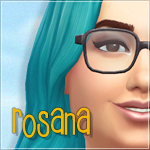 My name on (my own) forums however is Rosana or Rosie. On other websites, these names are often taken, so I just go by the nickname Rosiewosie. You may have come across one of my many accounts on social networking sites. Usually, when there is a Rosiewosie, it's me. I am 24 years old right now. I don't know if I'll update this particular post each year from now. So in case it's outdated, you can do the math yourself. I was born in 1984. I gave birth to my first son (Seth) in October 2007. He's now 8 months old (and pretty much a handful). He's my number one priority. He comes before anything else, including the websites (as it should be). The proud daddy is ChEeTaH. ChEeTaH happens to be a webmaster himself at The Sims Zone and The Spore Zone. I currently live in a nice apartment with my family. However, we do have serious plans to move to California in a few years. We'll probably move tot he Bay Area. We both want to work and live there. Until that day, we'll stay here in Southern Netherlands. I'm a work-at-home-mommy (or work-from-home-mommy). My job has everything to do with digital media: web development and web design, graphics design, game design and photography, print media and so on. I'm all round and I plan to have my own studio in the future (but not for a long time though). I love traveling, especially when we visit 'home', which is San Francisco for me. I have traveled many times for game events. You should check out this list on my website to get an idea. My hobbies? Well I think the activities mentioned above are more than enough to handle! If you are interested in knowing more about me and reading my blurbs, please do visit my blog and portfolio at Miss Design. I often blog about geeky stuff, fun stuff, photography, family and much more. I don't know what else to add! If you have any questions whatsoever, be sure to ask them! Took me a while... but I just noticed. Noone came to say hey to you in your own welcome post ! Thank you both! It's indeed a bit weird to introduce myself on my own forums. On the other hand, some people who'll join in the (near) future may not know anything about me. This post can help, if even a little, to get to know me. I assume "Others" are penguins and tigers? Or are they people from yet unknown tribes in the tropics? ChEeTaH wrote: I assume "Others" are penguins and tigers? Or are they people from yet unknown tribes in the tropics? Those too! Those red and black colored tropical peeps!